After I completed my RAF police training at RAF Debden, I was posted to my first unit, RAF St Mawgan. St Mawgan is in Cornwall just outside Newquay, a very busy seaside resort. My first job was 'Trogging'. Let me explain; 'trogging' is armed patrolling of a facility,in this case a weapons facility, whereby you move from one area to another at regular intervals including watch duties from a tower. I did this for 8 months in all weathers wearing inadequate wet weather clothing. During one of my shifts I was informed by the senior Cpl of the shift that I was posted to Cyprus. I did not believe him. But it was true and I flew to Cyprus on a VC10 in May 1972. My first sight of Cyprus whilst alighting from the aircraft, was of an old woman dressed all in black, leaning on her shovel picking her nose!! at that time the women did most of the work, including mending the roads! I was to spend two and a half happy years at RAF Episkopi. During my time at there I was employed on a variety of duties: Traffic patrols, general patrolling of the camp and the surrounding areas and control of entry duties at various sites. 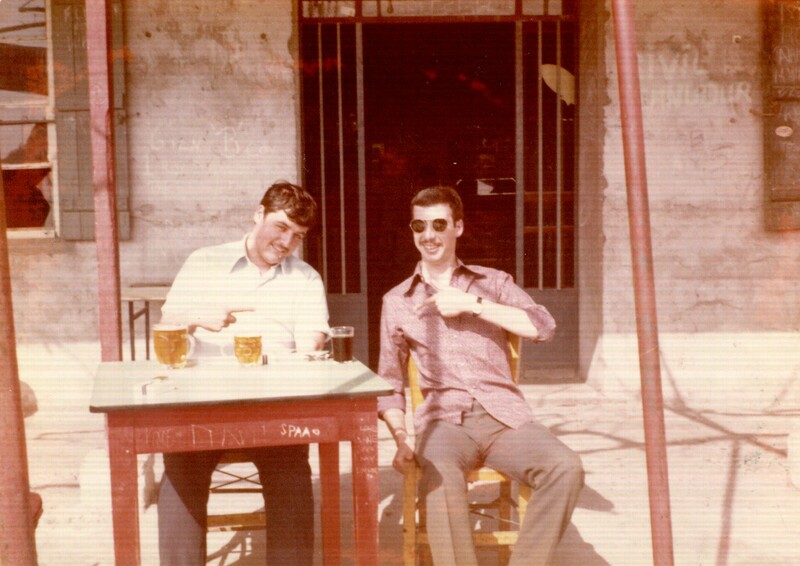 I loved Cyprus, the work, the climate, the people and of course the social life, a very exciting place for a young 20 year old who had never been outside the UK. I had some excellent mates from all trades and we had some memorable times. It was during my time that there was a 'Coup' and the Turkish Army invaded Cyprus. Click on link (Cyprus Emergency 1974) for a brief history of that time. A point of interest in the history is the reference to RAF Police on the M1 'their faces as white as their hats' , that was me!!! Very scary!! Me and ? (cannot remember his name, if anyone knows please let me know) outside 'Jack's Bar' Episkopi Village. In July 1974 I was promoted to Sub Cpl. I was posted to RAF Wittering (the home of the Harrier) in Cambridgeshire in Nov. 1974. Not long after my arrival I passed my motorcyle test and from then on I rode a Norton 750cc Commando,(these needed to be 'kick started' no electric start then), on convoy duties, we spent most of our time away from base. I travelled the length and breadth of the country and in the process gained 2 stone in weight, to much beer! I was posted to RAF Provost and Security Services (NG), RAF Gutersloh in Northern Germany in May 1976. I thoughly enjoyed my tour in what was the first in Germany, later I would be posted to RAF Laarbruch. My duties at P&SS(NG) were mainly traffic and disciplinary. In my time there I attended 100's of traffic accidents, fatalities and ones with serious injuries to the 'fender benders'.I also went to two horrific aircraft accidents involving RAF fast jets. Towards the latter part of my tour I was employed on Air Transport Security (customs,immigration and aircraft security duties). RAF Gutersloh was an AirHead for troop and families movements in Northern Germany. I loved my time in Germany, both the work and my social life were very rewarding I met up with old friends and made some good new ones. I was posted to RAF Waddington in Lincolnshire in Nov 1978. 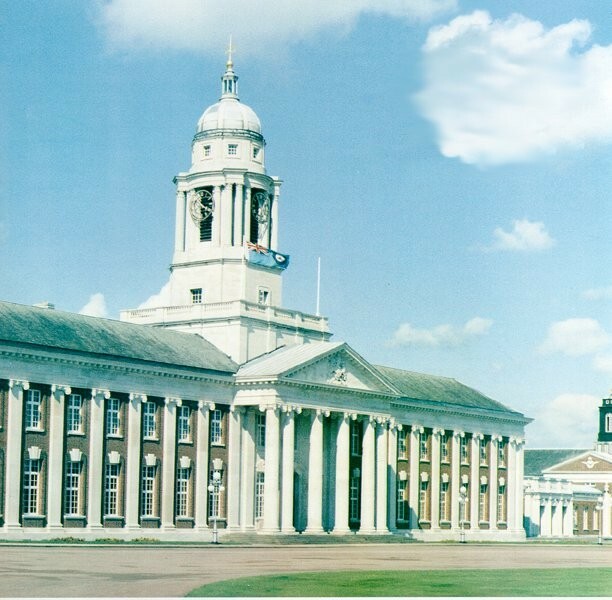 I only spent 3 months there, I hated it, I did an exchange posting with Cpl Bill White to RAF Cranwell in Jan 1979. Iv'e got to thank Bill White, Cranwell was where I met and married my wife Eileen. Cranwell was very interesting work wise but what really made it for me was the social life, mainly in the NAAFI, The White Cranes Club. I number of us from various trades formed 'The Over 25 Club', a loose association of 'boozers' who had a lot of fun and raised money for charity, if anyone remembers please get in touch. I was posted to RAF Laarbruch in Nov. 1981. Because no married quarters were immediately available at RAF Laarbruch, Eileen did not join me until Jan 1982. When she did we moved into an excellent 2 bedroom Married Quarter on the camp opposite the Maas Junior School. We spent 4 1/2 happy years there, we would have stayed longer but the RAF decreed that it would be a better career move for me to be posted back to the UK. Whilst at RAF Laarbruch I reverted back to my first duties in the RAF Police, I was 'trogging' again! However, my wife and I also ran the RAF Police Club for two years. 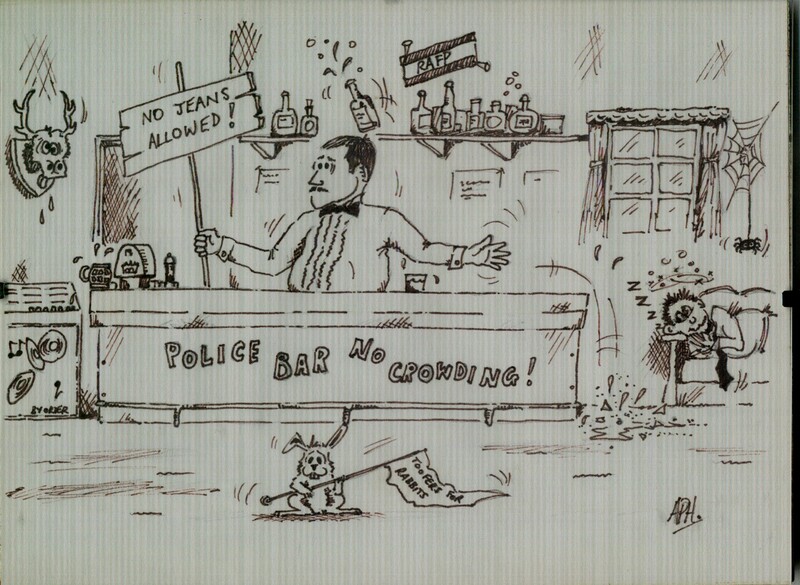 Below is a cartoon produced by one of the Cpl's during a dispute over the dress standards and conduct in the club. We had some wonderful times at Laarbruch and we managed to travel over a good part of Germany in our old Ford Cortina. After a spell working in the NAAFI supermarket on camp and assisting in the running of the Police club, Eileen eventually worked on the German economy for Pete and Heide the owners of an establishment in Weeze,we became good friend and we still correspond to this day. From RAF Laarbruch and its spacious AMQ and good facilities we were posted to RAF P&SS(SR) at RAF Rudloe Manor, near Chippenham, Wiltshire in May 1986. We arrived at RAF Rudloe Manor in the middle of the night having travelled all day, I picked up the keys to the MQ and we eventually found the MQ at RAF Colerne some 6 miles away and up a very steep, small winding road. Unable to find the married patch in the pouring rain we were eventually rescued by the 'MOD Plods' (Ministry of Defence Police) and shown the MQ, we arrived there at 2am, cold, wet and miserable. What a shock! it was a two bedroom house, unclean, smelly and had not been lived in for some 9 months! Worse was to come, when our boxes arrived from Germany we were unable to fit them into the house it was that small. A nightmare of a house. I was posted to RAF Lossiemouth on promotion to Sgt in 1987. Lossiemouth, outside Elgin City in Morayshire, Scotland is one of the best place I have visited in the UK.